To highlight the main information desk at the Landvetter Airport in Gothenburg, the designers from Annell created the concept of an impressive chandelier suspended overhead. 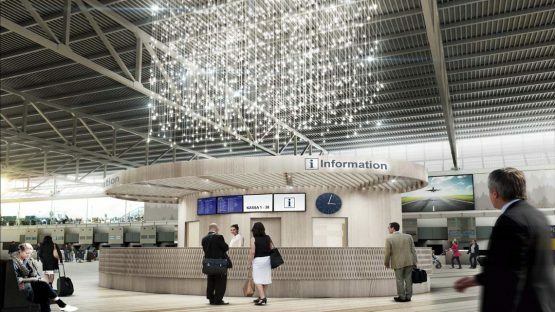 The six-hundred sparkle light guides, terminated in heavy hand-made glass pieces are a superb focal point visible from every place and angle of the airport’s main lounge. Five kilometers of SSF102 sparkling sidelight guides, powered by color-changing MDI812 gas-discharge illuminators, holding 600 hand-made Murano glass drops.